It may be that Percy French was Ireland's most famous songwriter, poet and entertainer. His large portfolio of songs included The Mountains of Mourne, see the panel on the left - the song has 5 verses, but only two are reproduced here. Song writing was just one of his gifts. Others included entertaining from the stage. Percy became ill while performing in Glasgow and died some days later from pneumonia. He had travelled to Formby and was staying at the home of his cousin Canon Richardson of Green Lea, College Avenue on 24 January 1920, aged 65. His grave is in St. Luke's churchyard, just a few yards in front of the main church entrance. 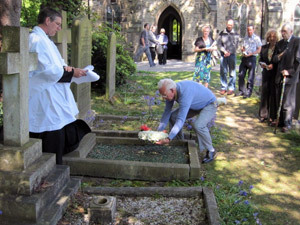 The Percy French Society make occasional visits to Formby where they commemorate his life with a service around his grave. St. Luke's clergy and other church members help in this.